The reluctance of Canada’s real estate industry to share access to its secret database of homes on the market has now driven at least one Canadian startup out of the country. 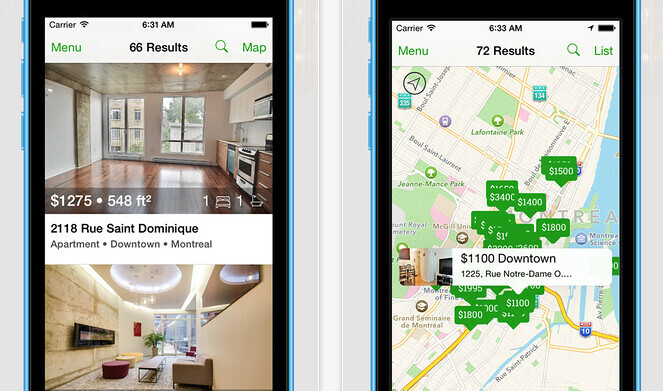 Instavisit, an apartment-hunting app for the iPhone, launched in Montreal earlier this month. Last week, it expanded to Las Vegas and its creators plan to add New York and San Francisco to the app before the end of June. But while Instavisit was developed in Montreal, don’t expect to see any other Canadian cities on it any time soon. That’s because in Canada, the real estate industry jealously guards access to the Multiple Listing Service, a database of information about homes on the market. And, according to Instavisit’s co-founder and COO Alain Kapatashungu, that means it’s much harder to scale the company here in Canada. In Montreal, Kapatashungu and his team are working with local real estate brokerages but building those types of relationships in other cities and ensuring enough apartments are listed on the app to make using it worthwhile would be a long process. “To build this company, unfortunately, we can’t do it here,” he says. In the U.S. it’s a different story, access to MLS databases is much more open and in some places can be accessed though an API. Right now, the app allows users to search for apartments and to book a viewing by directly accessing the landlord or real estate agent’s calendar. The idea is to make scheduling simpler for apartment hunters and allow the property managers, landlords and real estate agents to see whose coming and have that information seamlessly integrated into their calendars. But Kapatashungu wants to take it further than that. Users will soon be able create a profile with information like the neighbourhood they want to live in, their price range, number of rooms they want and other important factors. The app will then give users picks based on that profile. It will even be able to book visits automatically, based on the user’s availability. He says the full concierge version is scheduled to launch over the summer, that’s also when an Android version of the app will launch (it’s currently only available for iOS, Kapatashungu says that’s because 54 per cent of all real estate agents in North America have an iPhone). As well, the full version will include condos and houses that are for sale in addition to the rentals that currently listed on Instavisit. Kapatashungu says he sees real estate brokerages and property managers as his customers, at least when it comes to monetization. They’ll be charge a fee for visits booked through the app. But while the U.S. market will be easier to tap into, at least when it comes to getting listings on the app, Kapatashungu will still need to win over property providers in order for his app to be as useful as he wants it to be. One of the first cities he’s targeting will be the biggest challenge. “In New York, there are so many realtors and property managers, the difficulty will be getting them involved,” he says. Still, he believes his app will have enough benefit that they’ll come on-board.